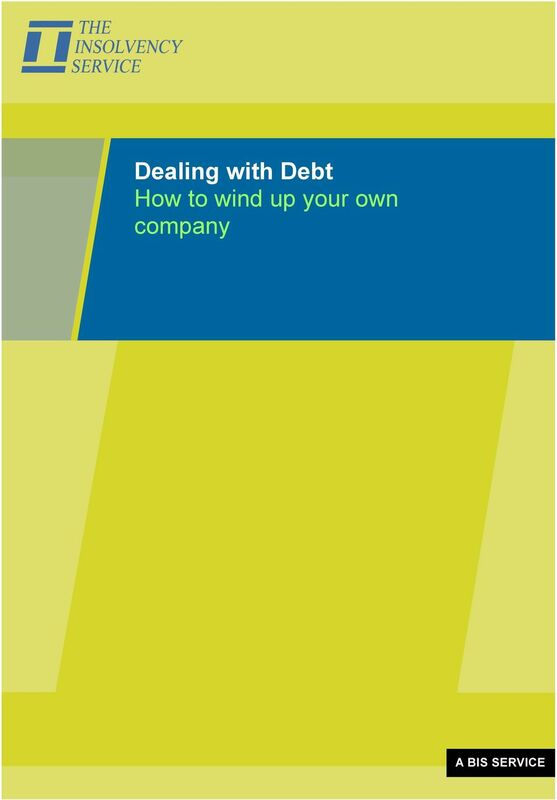 Download "Dealing with Debt How to wind up your own company"
5 be made by the majority of directors on a date no more than 5 weeks before the passing of the resolution for voluntary winding up; be filed at Companies House; state that the directors have made a full inquiry into the company's affairs and are of the opinion that the company can pay its debts and interest within a maximum of 12 months; and include an up-to-date statement of the company's assets and liabilities. It is a criminal offence to make a declaration of solvency without reasonable grounds. The shareholders must hold a general meeting of the company that passes a resolution: for voluntary winding up; and appointing one or more liquidators of the company. The shareholders must pass a special resolution for winding up, unless: the company resolves that it cannot continue its business because of its liabilities, when an extraordinary resolution is required; or the articles of association of the company provide for it to be dissolved at a certain time, or following a certain event, when an ordinary resolution is required. 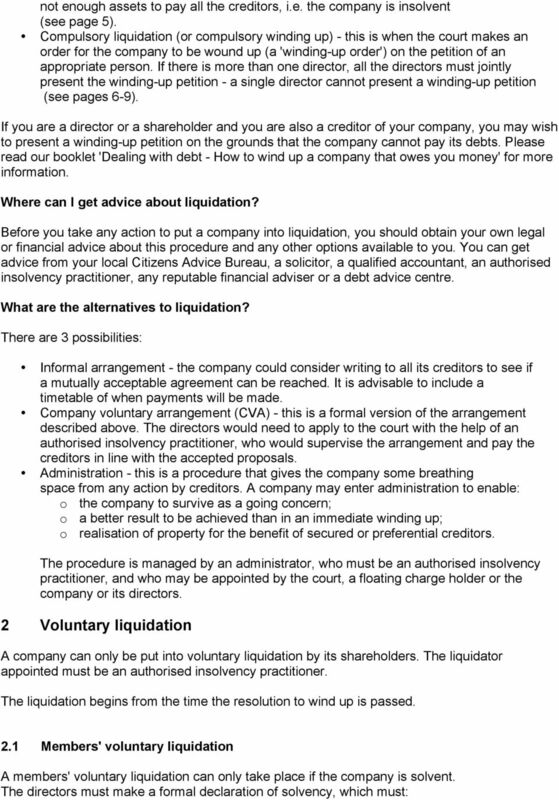 If it later turns out that the company is not solvent, the liquidator will call a meeting of creditors and the liquidation becomes a creditors' voluntary liquidation (see below). 2.2 Creditors' voluntary liquidation If the majority of directors do not make a declaration of solvency, or the company is insolvent, the shareholders can still vote for a voluntary liquidation. 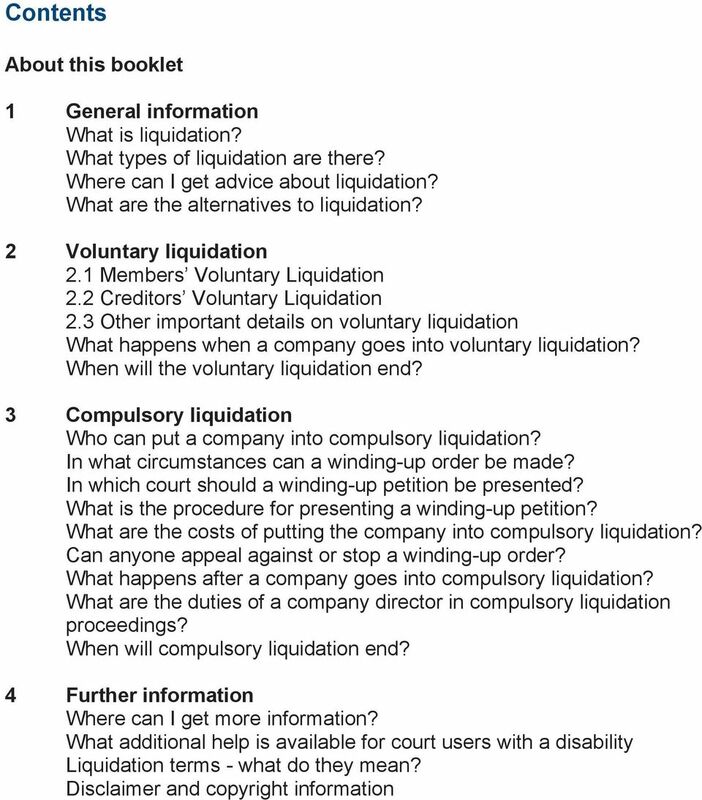 This type of liquidation is called a creditors' voluntary liquidation. 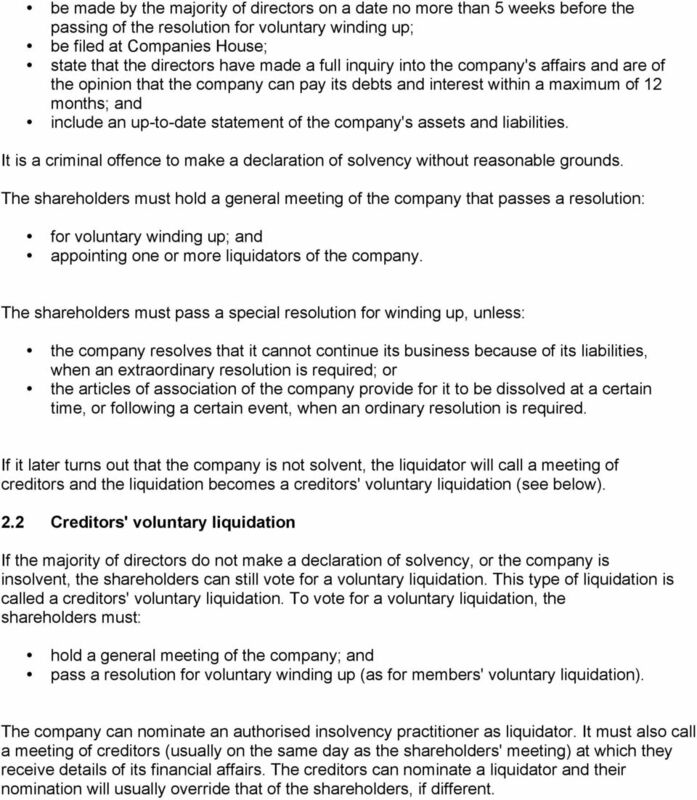 To vote for a voluntary liquidation, the shareholders must: hold a general meeting of the company; and pass a resolution for voluntary winding up (as for members' voluntary liquidation). The company can nominate an authorised insolvency practitioner as liquidator. It must also call a meeting of creditors (usually on the same day as the shareholders' meeting) at which they receive details of its financial affairs. The creditors can nominate a liquidator and their nomination will usually override that of the shareholders, if different. 6 2.3 Other important details on voluntary liquidation What happens when a company goes into voluntary liquidation? 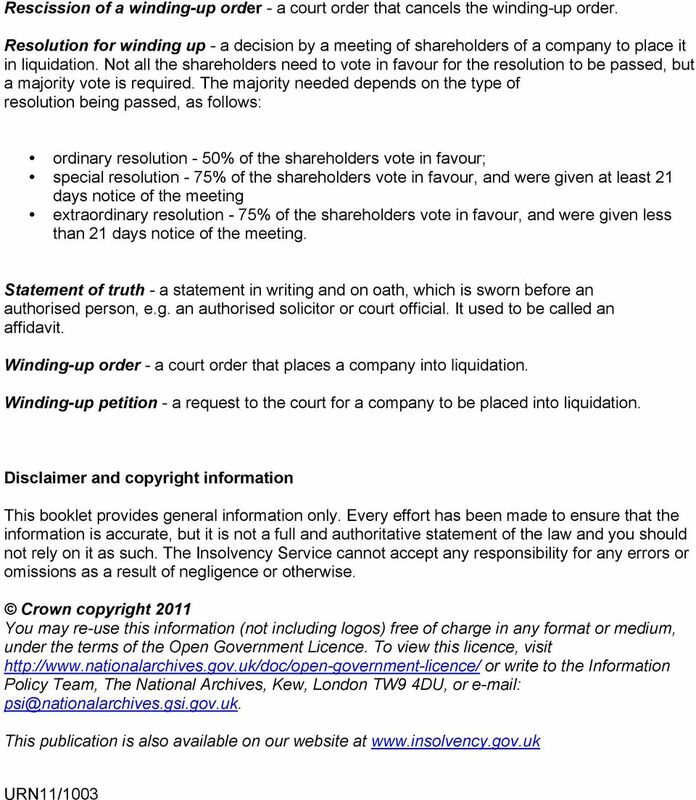 The liquidator takes control of the company's affairs and almost all powers of the directors cease. The liquidator disposes of all the company's assets and, after paying the costs and expenses of the liquidation, distributes any remaining money to the creditors. 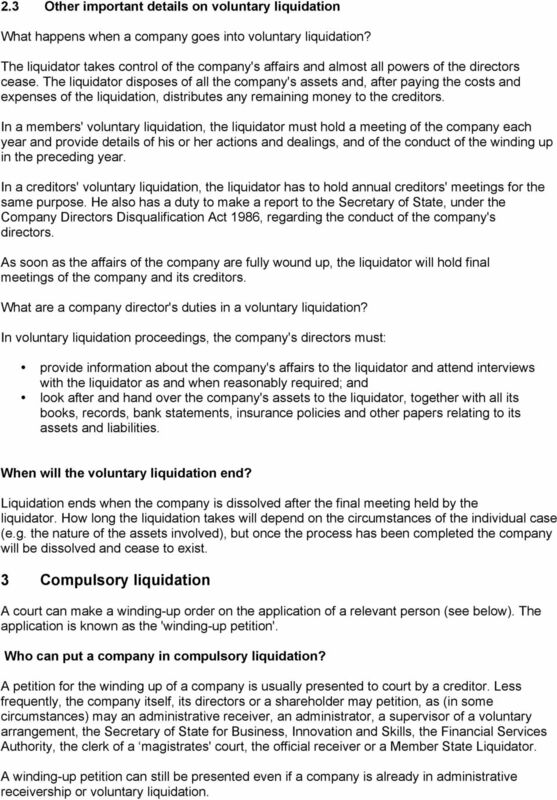 In a members' voluntary liquidation, the liquidator must hold a meeting of the company each year and provide details of his or her actions and dealings, and of the conduct of the winding up in the preceding year. In a creditors' voluntary liquidation, the liquidator has to hold annual creditors' meetings for the same purpose. He also has a duty to make a report to the Secretary of State, under the Company Directors Disqualification Act 1986, regarding the conduct of the company's directors. As soon as the affairs of the company are fully wound up, the liquidator will hold final meetings of the company and its creditors. What are a company director's duties in a voluntary liquidation? In voluntary liquidation proceedings, the company's directors must: provide information about the company's affairs to the liquidator and attend interviews with the liquidator as and when reasonably required; and look after and hand over the company's assets to the liquidator, together with all its books, records, bank statements, insurance policies and other papers relating to its assets and liabilities. When will the voluntary liquidation end? 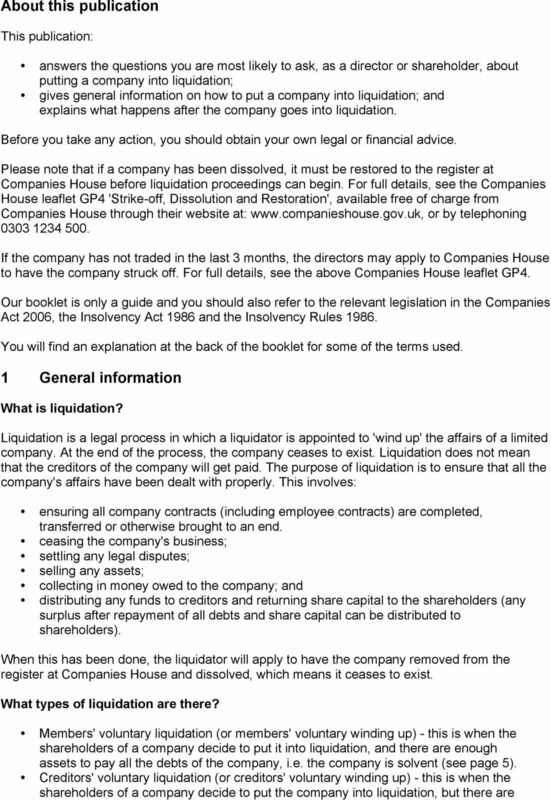 Liquidation ends when the company is dissolved after the final meeting held by the liquidator. How long the liquidation takes will depend on the circumstances of the individual case (e.g. the nature of the assets involved), but once the process has been completed the company will be dissolved and cease to exist. 3 Compulsory liquidation A court can make a winding-up order on the application of a relevant person (see below). The application is known as the 'winding-up petition'. Who can put a company in compulsory liquidation? A petition for the winding up of a company is usually presented to court by a creditor. Less frequently, the company itself, its directors or a shareholder may petition, as (in some circumstances) may an administrative receiver, an administrator, a supervisor of a voluntary arrangement, the Secretary of State for Business, Innovation and Skills, the Financial Services Authority, the clerk of a magistrates' court, the official receiver or a Member State Liquidator. A winding-up petition can still be presented even if a company is already in administrative receivership or voluntary liquidation. 7 In what circumstances can a winding-up order be made? A winding-up order can be made if the company: has decided that it should be wound up by the court; registered as a public limited company more than a year previously but has not yet been issued with a trading certificate; is an 'old' public company; has not begun trading within a year of its incorporation or has suspended its trading for a whole year; has less than two shareholders, unless it is a private company limited by shares or guarantee; cannot pay its debts; has reached the end of a moratorium without approval of a voluntary arrangement; or should be wound up because the court forms the opinion that this would be just and equitable. In which court should a winding-up petition be presented? The winding-up petition should be presented in the High Court, or the District Registry of the High Court that covers the area where the company's trading address or registered office is situated. If the company's share capital, paid up or credited as paid up, is not more than 120,000, the petition can be presented in the county court that deals with insolvency matters that covers the area where the company's trading address or registered office is situated. What is the procedure for presenting a winding-up petition? To ensure that all legal requirements are met, it is usual to instruct a solicitor to deal with issuing a winding-up petition. To present a winding-up petition, you cannot just complete the petition and present it to the court. Insolvency law requires that before the court can hear the petition, statements of truth must be lodged at court verifying the winding-up petition. The petition must usually be served on the company at its registered office. A certificate of service of the petition must be filed at court at least 5 business days before the hearing. The petition must be advertised in the London Gazette at least 7 business days after the petition is served on the company and at least 7 business days before the hearing. Further statements of truth may be required if, for example, you wish to withdraw the petition. 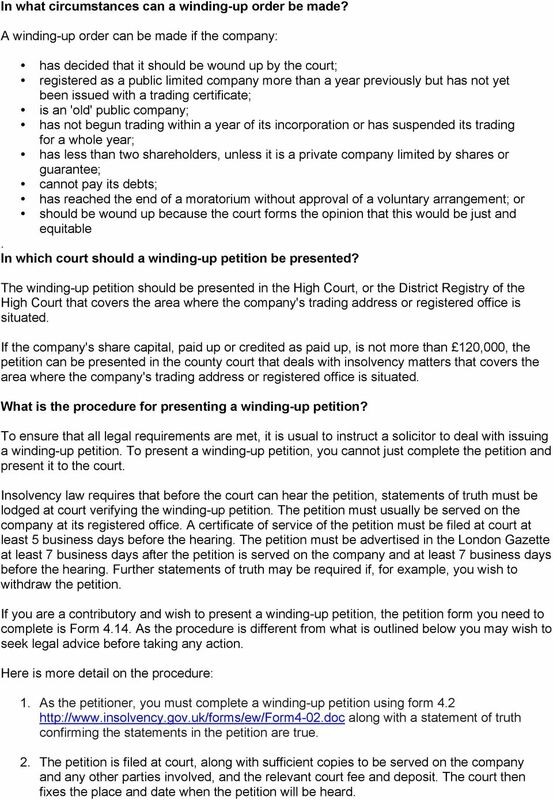 If you are a contributory and wish to present a winding-up petition, the petition form you need to complete is Form As the procedure is different from what is outlined below you may wish to seek legal advice before taking any action. Here is more detail on the procedure: 1. As the petitioner, you must complete a winding-up petition using form along with a statement of truth confirming the statements in the petition are true. 2. The petition is filed at court, along with sufficient copies to be served on the company and any other parties involved, and the relevant court fee and deposit. The court then fixes the place and date when the petition will be heard. 8 3. A copy of the petition (sealed by the court) must be served on the company at its registered office, or if this is not possible, at the company's last main place of business, or on a company director or company secretary. A copy of the petition (sealed by the court) must be sent to any voluntary liquidator, administrative receiver, administrator, supervisor of a voluntary arrangement or Member State liquidator appointed to the company. Service of the petition must be proved by a certificate of service. You must file it in court not less than 5 business days before the hearing of the petition. 4. At least 7 business days before the hearing, the petitioner must advertise notice of the petition (Form 4.6) in the London Gazette. This enables other interested parties to inform the petitioner that they wish to attend the hearing, and whether they wish to support or oppose the petition. 5. At least 5 business days before the hearing, the petitioner must file at court a certificate of compliance with the rules relating to service and advertisement along with a copy of the advertisement in the Gazette. 6. If the company wishes to oppose the petition, it must file its statement of truth in opposition at least 5 business before the hearing. 7. On the day of the hearing, the petitioner must prepare a list, for the court, of the people appearing at the hearing using form At the hearing, the petitioner, creditors, the company and its shareholders all have the right to be heard, and the court may also choose to hear anyone with an interest in the company's property. The court can then: dismiss the petition; adjourn the hearing; make a winding-up order; make an interim order; or make any other order it thinks fit All the forms are in the Insolvency Rules 1986 as amended, and you can get them from legal stationers - see Yellow Pages. Some of the forms are available on The Insolvency Service website at where you can print them off for completion. What are the costs of putting the company into compulsory liquidation? Petition deposit of 1,165 towards the costs of administration of the liquidation; A court fee of 220; The costs involved in advertising the petition in the London Gazette; Any costs for instructing a solicitor. 9 Can anyone appeal against or stop a winding-up order? There are 3 ways that winding-up proceedings can be stopped: The court can rescind (i.e. cancel) a winding-up order. The company (or anyone else) can apply for it to be rescinded if the court did not have all the relevant facts when making the winding-up order. Application should be made within 5 business days of the order being made. The company can appeal against a winding-up order. As a result of an appeal, the court can rescind the winding-up order or otherwise vary its decision. An appeal should be made within 4 weeks of the order being made. Liquidation proceedings can be 'stayed' (i.e. stopped), permanently or temporarily, on the application of the liquidator, the official receiver, a creditor or a shareholder or the liquidator in proceedings opened against the company in another Member State of the European Union. 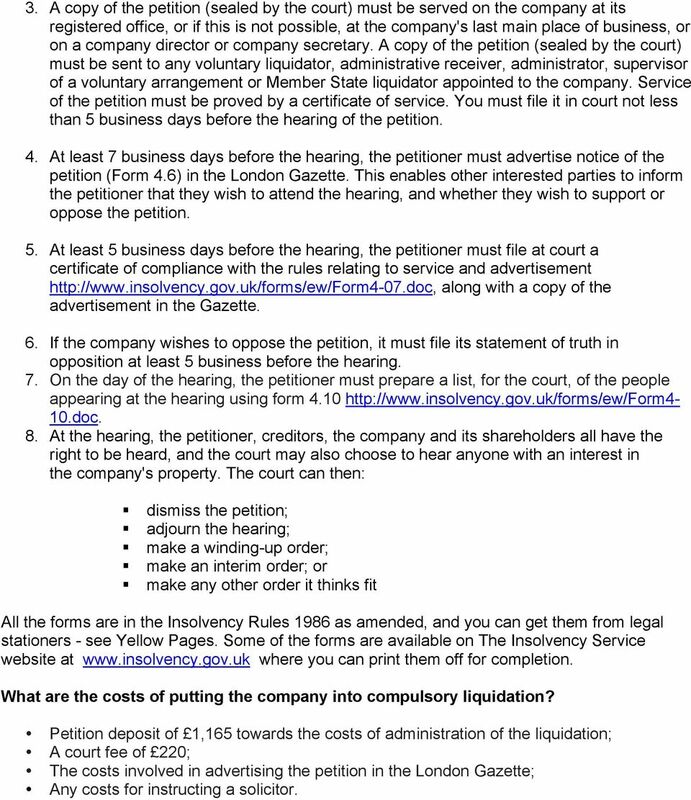 If liquidation proceedings are stayed permanently, the directors usually regain control of the company. An application to stay the liquidation proceedings can be made at any time after a winding-up order has been made. What happens after a company goes into compulsory liquidation? Usually, the official receiver (who is both a civil servant in The Insolvency Service and an officer of the court) will be appointed liquidator of the company on the making of a winding-up order. The official receiver has a duty: as official receiver - (a) to ensure that notice of the winding-up order is advertised in the Gazette and in addition, the official receiver has discretion to advertise the order in any other way, if they think it is appropriate to do so; and (b) to investigate the affairs of the company and to establish the cause of its failure (by obtaining information from the directors of the company and from third parties, such as the company's bankers, accountants and solicitors); as liquidator - to collect and realise all assets and pay all creditors. The official receiver may call a meeting of creditors to appoint an insolvency practitioner as liquidator in their place but, if this happens, they still have a duty to investigate the company's affairs. So, 2 people may be involved in the liquidation: the liquidator, who is responsible for collecting and realising the assets and paying the creditors; and the official receiver, who investigates the company's affairs. The official receiver also has a duty to make a report to the Secretary of State under the Company Directors Disqualification Act 1986, regarding the conduct of the company's directors. 11 The address and telephone number of your local county court are listed under 'Courts' in the phone book, where you should look for 'civil courts county courts' and not magistrates' courts. The Courts Service website at: has an index of county courts that have jurisdiction to hear insolvency cases. 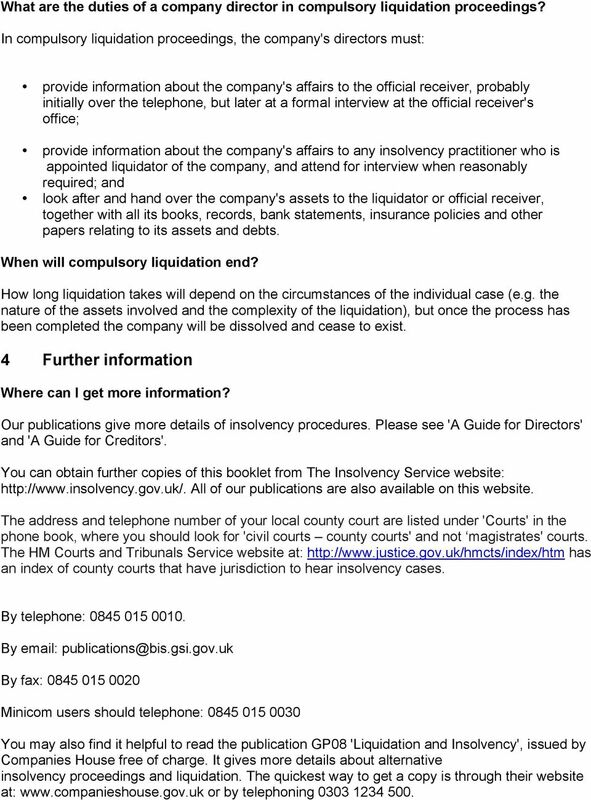 You can also contact The Insolvency Enquiry Line for general enquiries, on , or us at: For general enquiries to the Courts Service, you can call their Customer Service Unit on , or them at: This publication provides general information only. Whilst every effort has been made to ensure that the information is accurate, it is not a full and authoritative statement of the law and you should not rely upon it as such. The Courts Service and The Insolvency Service cannot accept responsibility for any errors or omissions as a result of negligence or otherwise What additional help is available for court users with a disability? If you have a disability that makes going to court or communicating difficult, please contact the Customer Service Officer of the court concerned, who may be able to help you. If they cannot help you, you can contact the Courts Service Disability Helpline free on between 9am and 5pm, Monday to Friday. 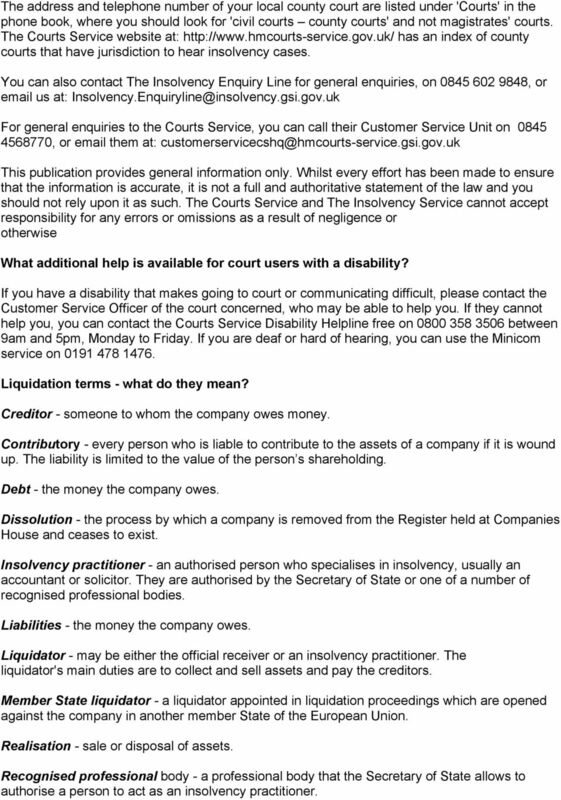 If you are deaf or hard of hearing, you can use the Minicom service on Liquidation terms - what do they mean? Creditor - someone to whom the company owes money. Contributory - every person who is liable to contribute to the assets of a company if it is wound up. The liability is limited to the value of the person s shareholding. Debt - the money the company owes. Dissolution - the process by which a company is removed from the Register held at Companies House and ceases to exist. Insolvency practitioner - an authorised person who specialises in insolvency, usually an accountant or solicitor. They are authorised by the Secretary of State or one of a number of recognised professional bodies. Liabilities - the money the company owes. 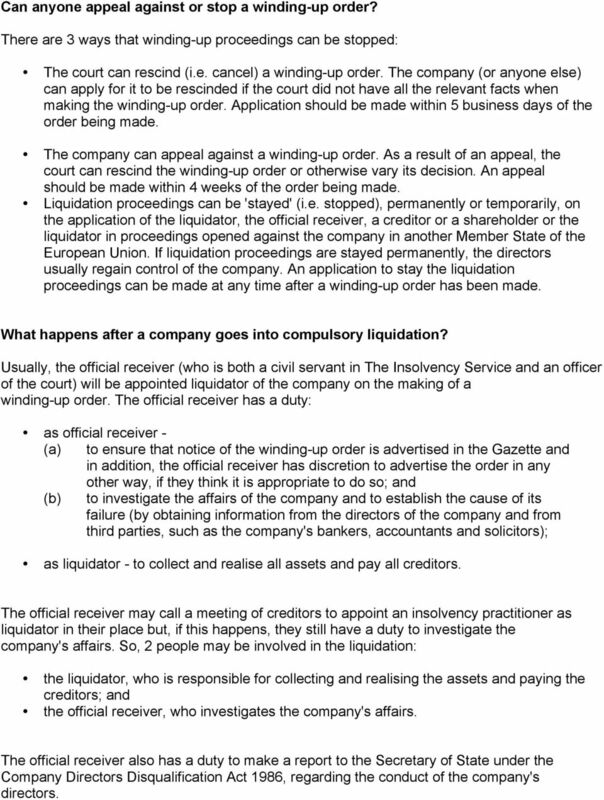 Liquidator - may be either the official receiver or an insolvency practitioner. The liquidator's main duties are to collect and sell assets and pay the creditors. Member State liquidator - a liquidator appointed in liquidation proceedings which are opened against the company in another member State of the European Union. Realisation - sale or disposal of assets. Recognised professional body - a professional body that the Secretary of State allows to authorise a person to act as an insolvency practitioner. Liquidators, Receivers and Examiners Their duties and powers A quick guide Contents About this guide 2 What are liquidations, receiverships and examinerships? 2 What are liquidators, receivers and examiners? Can my bankruptcy be cancelled? This leaflet covers the questions you are most likely to want answered on how the court may annul (cancel) your bankruptcy order: What is the annulment of a bankruptcy order? www.insolvency.gov.uk Company Directors Disqualification Act 1986 and Failed Companies Information on Disqualification Procedures The courts have long been able to impose orders disqualifying company directors. Company Investigations What we do. Higher National Unit specification. General information. Unit code: H49N 35. Unit purpose. Outcomes. Credit points and level. How will bankruptcy affect my bank account? Directors Duties: Companies in Financial Difficulty Preliminary The purpose of this Fact Sheet is to brief the owner-manager on the duties and liabilities of a director whose company is in financial difficulty.